A historic town with plenty of activities to keep you busy. The history of this town date backs as far as 2000 BC and it was inhabited by the Pretalayotic settlers and the burial sites can still be seen today. The town was eventually conquered by the Romans and they brought some order to the town and stopped the piracy that was prevalent at the time. They built a well-organised town with well-maintained roads, sewers and fresh drinking water. After the Romans left the town was vandalised and the Moors eventually rebuilt the town and called it Al Qudya (the town on the hill). The town has been developed for tourism since the early 20th century and they started building hotels in the 30’s. The new development has been taking place since the 70’s but making sure the authentic buildings of the old town are still in place. With Alcudia’s long history there are many historical sites that you can visit like the Romans remain in Pollentia. The town centre has its own ruins such as the medieval and renaissance walls. The Neogothic Church of Sant Jaume. There is attraction for the contemporary art enthusiasts where the 16th to the 19th-century paintings are kept along with 20th-century sculptures in the Sa Bassa Blanca Museum. For the bird watching fan, the natural parks of S’Albufera and S’Albuferets are nearby where there is an abundance of bird species in these wetlands. The main sporting events that take place in Alcudia include cycling, hiking and golf. 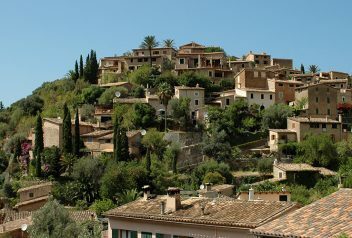 There are numerous hotels that will allow non-residents that want to play tennis which is also very popular in Alcudia. 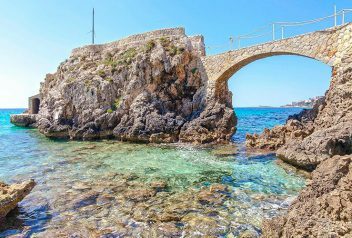 The walks include the peninsula that is in the north of Alcudia which is through the beautiful countryside and amazing panoramic views of the coast and the sea on either side. Families can enjoy the water park in Port d’ Alcudia with lots of different swimming pools and water slides. There are plenty of water activities that the whole family can enjoy. The park not only features slides and pools but you can also enjoy paintball and there is a selection of restaurants to choose from. 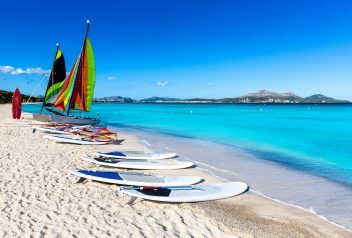 The Alcudia beach is one of the best beaches with its fine sand and it stretches from the port and is commonly known as the golden mile. 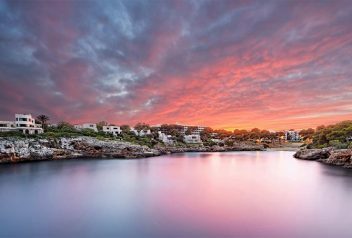 The whole coastline is lined with hotels and the resort of Alcudia has been a favourite of tourists that visit Majorca for years and the main reason is the beach. The beach towards the Port is not that great but that is where all the cafes and facilities are situated. Further along the beach, it is much quieter and there are public bus services that run from the dedicated free parking spaces. The restaurant in Alcudia specialises in Mallorcan food which consists of hearty stews and stuffed vegetable dishes. There are restaurants that serve the traditional Tapas and establishments that are offering modern variations to the traditional Mallorcan food. 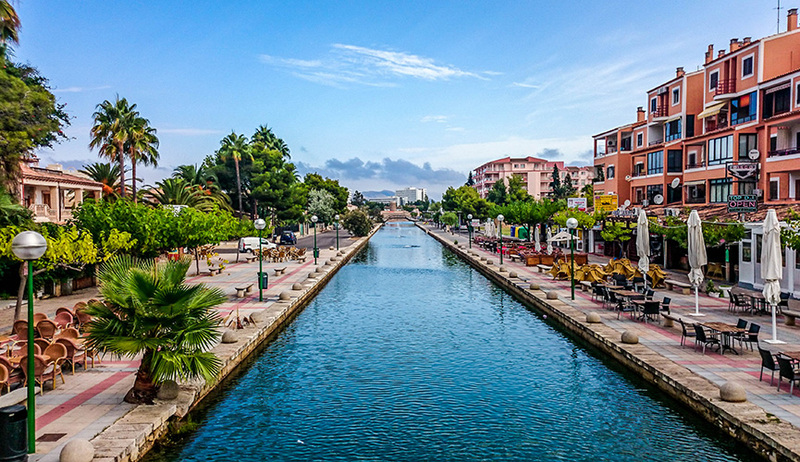 There are some fun and exciting night spots in Alcudia where you can enjoy live music, karaoke and lively bars. These bars and clubs are generally found in Dollar Street. The other places that host some nice clubs are the port of Alcudia and the marina which is also in the Port. There are over 250 hotels in Alcudia and they range from luxury 5-star hotels to budget hotels. 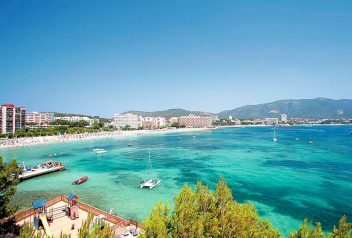 Some of the 5 Star hotels that are available are the Viva Zafiro Alcudia and Palace de Muro. There is no shortage of accommodation in Alcudia and there are hotels that will suit every budget. Alcudia prides itself on being a great resort with very good hotels. You can be sure to find the perfect hotel for your stay here in this resort.